Ground Penetrating Radar Systems (GPRS) was requested on site by a general contractor at Kohl’s to perform a Ground Penetrating Radar (GPR) scan. The contractor needed to saw cut several areas of the building, however prior to saw cutting, they wanted to have each area scanned. Thanks to GPRS, LLC. the conduits were marked out to ensure no conduits would be hit. 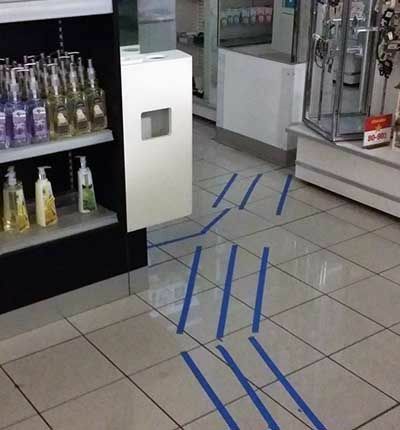 In addition to marking the results of the scan onto the project surface with blue tape, a drawing was also submitted to the contractor. All conduits were marked out in areas of concern. Ground Penetrating Radar Systems is the best way to ensure the locations of reinforcement and conduits prior to cutting/drilling through concrete, and if you would like to learn how GPRS can assist you with your next project, please contact GPRS Project Manager, Micah Stair at (330) 639-8933 or by email at micah.stair@gprsinc.com. We also have the capabilities of locating rebar and post tension cables in a concrete slab along with any underground utilities.